diary of a crazy person: Six Days! As my ticker says, there is only 6 more days before I leave for Florida! I am so excited, but the reality that I am going somewhere has not sunk in. ... for the conference, because much of my skills and knowledge need a major overhaul. ...for the free stuff you get at the trade shows. ...all the new ideas I will be able to bring back to the clinic. ...to be somewhere warm for 10 days. I have never been somewhere warm like this during winter! ...to have a bath everynight after the conference. ...to get some reading done in the evenings. ...to watch movies on the plane. ...for Eric to join me. I love traveling anywhere as long as he is there too! ...to go shopping at the Florida mall. I will be by myself, but I will have 270 stores to entertain me! ...to go to Disney World of course. The rides. The atmosphere. THE STORES! ...to go to Universal Studios. The rides. The atmosphere. THE STORES. Especially the stores. They have the candy shop from the Harry Potter books there! And many other cool stores from books/movies! ...that we have saved more than enough money for this trip, which means we have not taken out any loans, nor do we have to put anything on the credit card. That is such a great feeling. ...that being gone for 10 days before my Dr appointment will make the time pass faster, so it won't feel like I am waiting around. ...to do something that distracts me from infertility. I finally have something else to look forward to other than the end of a cycle or a Dr. appointment! 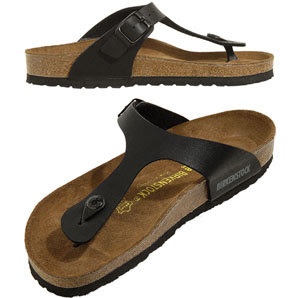 ...because I get to wear my beautiful Birkenstock sandals for 10 days!